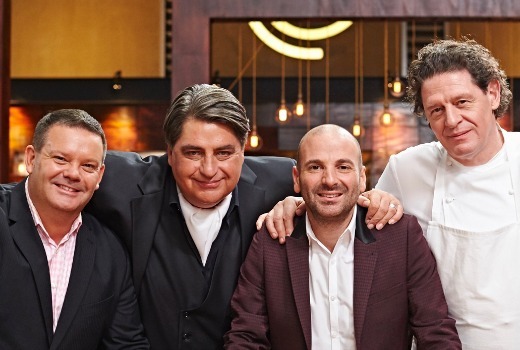 As it heads towards finals week, MasterChef Australia hit its best figures so far this year. 1.24m viewers was the top show on Wednesday, with a high-pressure service under Marco Pierre White. Also scoring a season best was Julia Zemiro’s Home Delivery on 707,000 viewers -next season ABC should promote her to an 8pm timeslot. It was much higher than the debut of How Not to Behave. While SBS also had a good night, it was Seven that took line honours, with Seven News outranking Nine’s. Seven network was 27.7%, TEN was 23.5%, Nine was 21.7%, ABC was 18.6% and SBS was 8.5%. Seven News (1.01m / 1.05m) ruled for Seven then Highway Patrol (752,000), Home and Away (749,000), Criminal Minds (725,000 / 498,000), Border Security (693,000) and Million Dollar Minute (535,000). MasterChef (1.24m) topped Wednesday shows. Also scoring for TEN were The Project on 727,000 / 543,000, TEN Eyewitness News (678,000) and Madam Secretary (617,000). Elementary was 263,000. Nine News (1.07m / 1.05m) was best for Nine then A Current Affair (935,000), RBT (617,000), Hot Seat (614,000). Movie: The Great Gatsby only managed 217,000. ABC News (833,000) led for ABC then season high numbers for Julia Zemiro’s Home Delivery on 707,000 followed by 7:30 (626,000), The Weekly with Charlie Pickering (620,000), How not to Behave (536,000) and Adam Hills: The Last Leg (476,000). Good numbers for Dan Snow’s History of Railways (363,000). Next for SBS were 24 Hours in Emergency (226,000), Tour de France (198,000) and SBS World News (187,000). Big Bang was best on multichannels at 272,000. Since Waleed Aly has been on The Project the numbers have steadily risen, now Julia Zemiro’s Home Delivery gets it’s best numbers with Waleed Aly as guest , might be a good time for SBS to start showing a repeat of Salam Café. Of course Waleed Aly could be considered another Channel 31 success story as well, given he started out there as did Salam Café. Don’t move Julia to 8pm: She’d be trampled by MasterChef and the other reality shows! I watched Madam Secretary….much better than on Tenplay…you get credits and a preview at the end…not just a dead stop like on Tenplay…which is a little disconcerting…. The rise for Criminal Minds is a pleasant surprise, hopefully it can get back to what it used to be, it’s not that far off. I’ll be pleased when Marco’s stink on MasterChef is over – I can’t stand his bullying of the contestants, the constant haranguing to go faster, faster and his requirement that they answer “yes Marco” at his every instruction. I understand why he does it, it’s just so annoying to listen to – and I bet the contestants are ready to strangle him at times. And the judges references to him as “the great man” are a bit over the top. But still loving M/C – betting on a finale between Georgia and Billie ! And the contestant should not be upset…they know what is expected..it is the old adage…If you cant stand the heat, get out of the kitchen. Yes he’s just preparing them for a real kitchen. I love him, he is clearly an outstanding trainer and mentor, you only need to look at the caliber of chefs that have worked under him to see that. The contestants would be loving it, what he is teaching them is invaluable experience. I thought it was such a shame that the Masterchef Professionals didn’t take off as Marco was really good in a main judging role. But who knows maybe they will try it again. Professionals is my favourite version of the UK Masterchef. I have actually enjoyed sunrise this week with Nat and Sam hosting. Poor Beretts being on there with 3 women. I find Nat lightens up a bit as host. I to loved MC last night. But tonight its all about the 2nd cricket test at Lords. I found How not to behave a bit condescending and too self conscious. It fits in with the ABC’s run of consumer and observational light ent shows, but it was too forced. I like Gretel, but even with a sidekick is very full on. I know it is wrong to judge a show on its first ep, but…. Add to the fact Marco is back has helped with the ratings. Agree, I love it when Marco appears on the show. And although not a rating success I really enjoyed him ruling the roost on Masterchef: The Professionals. I really hope Ten can keep this momentum going post MCA… every year it seems that the ratings collapse after the final. I don’t know if the Spelling Bee and the Bachelor can do it (unless there are some truly tragic ladies for media attention). I couldn’t watch HNTB as Gretel Kileen’s face was so shiny under the studio lights that it was too distracting. Julia’sJulia’s interview with Walid was again great. Give this woman a Graham Norton style chat show, she would be great. Carrie’s stance on breastfeeding and attack on Steve Price were perfect. This girl is fastly becoming a favourite of mine and among women I speak to. She’s doing all the right things (except for not knowing what BB cream is!!!) Love you Carrie!! Sure but she’s still on a show that gives Price a platform. Carrie would not be advocating to drop Price and neither is the show. She is advocating the right to disagree or challenge. It all works for the show.